“This is a victory for the American people and the rule of law. This executive order was unconstitutional before the ink on it was even dry. We live in a democracy. No one is above the law, including the president. President Trump might be able to tweet whatever comes to mind, but he can’t grant himself new authority because he feels like it. When you have a president who describes our judicial system as ‘a joke,’ the value of three equal branches of government becomes even clearer. This case is a check on the president’s abuse of power, which is exactly what the framers of the Constitution had in mind. The only way to stop a bully is to stand up to him. That’s what San Francisco has done. I’m grateful that we’ve been able to protect billions of dollars that help some of the most vulnerable Americans. We’re talking about low-income families, seniors, foster children and people with disabilities. This is money that helps provides food, health care and a roof over their heads. It’s money that pays for bridges and public transit. Those are the programs this administration targeted in its misguided attempt to vilify immigrants. But our teachers, doctors and police officers cannot be conscripted into becoming immigration agents. San Francisco’s sanctuary policies make our city safer by encouraging anyone who has been a victim or witness to a crime to tell police. We are a safer community when people can report a crime, bring a loved one to the doctor or take their kids to school without worrying it could lead to a family member being deported. 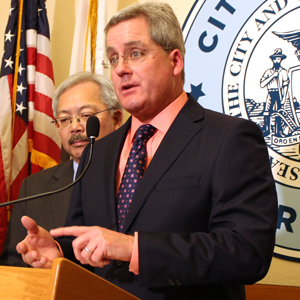 Today’s order also discussed San Francisco’s claim for relief that its sanctuary laws comply with federal law. The court did not rule on this claim, and instead stated it will consider that issue in the Sessions lawsuit.